ADULT: Wingspan - 40 - 47mm. 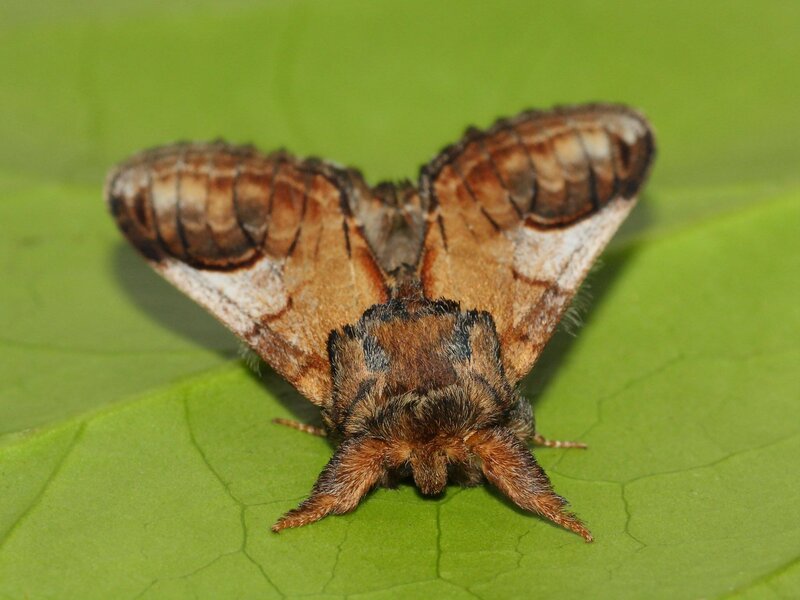 A reasonably common moth that is instantly recognisable with a light area in the centre of the leading half of the wing separating a darker grey-brown outer blotch and a light brown base. A central black curved mark emphasises the separation between colours and is diagnostic. In the typical form females tend to have browner hindwings than the male. CHRYSALIS: Found underground. Overwinters in this stage. LARVA: Greyish-brown and feeds with tail in the air. Feeds on Willows and Poplars. BEHAVIOUR: Attracted to light. HABITAT: Mainly damp areas but woodlands, hedgerows and gardens where foodplants grow are attractive to this species. FLIGHT PERIOD: Double brooded. May to August. STATUS: Common throughout mainland Britain.